In the mid 1990’s a committee of parents, staff, and community members came together to develop a character education program that would reinforce core values being taught at home and considered important in the life of a child. 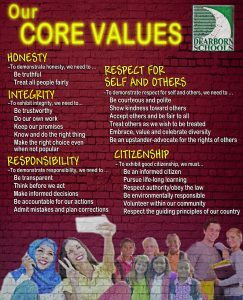 One of the results of the program was the creation of the CORE Values poster displayed in classrooms, offices, and other common spaces in District buildings. The poster is a daily reminder of the behaviors adults and students are expected to model and the expectations of all who enter the school. “Our CORE Values are not part of a “textbook” curriculum; rather these are the values our community has told us are important to them. Our job is to reinforce and model the positive values parents are teaching their children at home,” commented Dearborn Superintendent, Dr. Glenn Maleyko. The CORE Values received an update in 2003 and again in 2016 when a group of community members, staff, students, and parents came together to create a new strategic plan along with a new vision and mission. The Dearborn Public Schools CORE Values are: Honesty, Integrity, Responsibility, Respect for Self and Others, and Citizenship. Each CORE Value has supporting statements that describe the actions one needs to take in order to demonstrate the value. At the 2016 Response to Bullying Behavior event, renamed Care to the CORE, two new designs for the poster were revealed. An on-line contest was held using social media to select the winning design that features bright yellow text over a red brick wall. Prominent at the bottom of the poster is a collage of students representing the rich diversity of the Dearborn Public Schools. 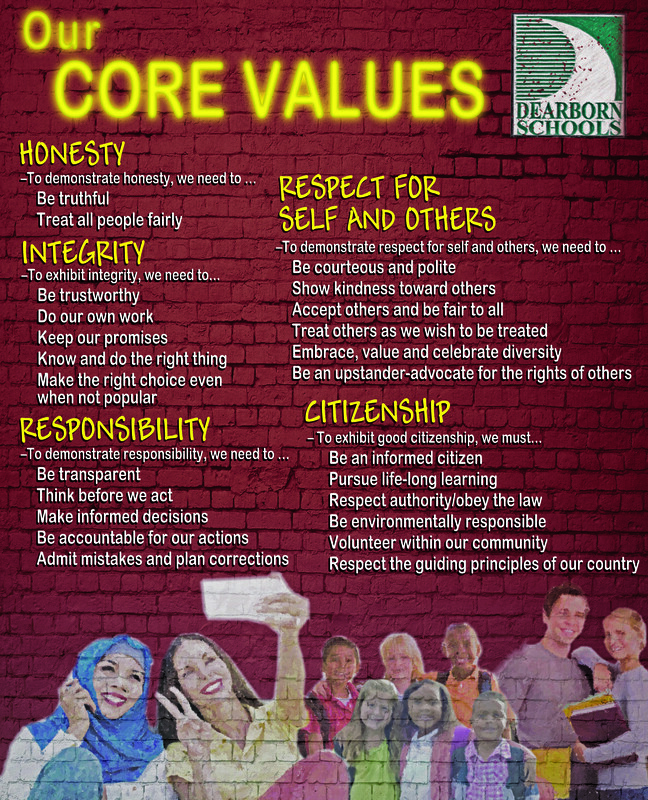 The new poster is now in all schools and local businesses and other establishments can contact the Dearborn Public Schools Communications Office at (313) 827-3006 to request a CORE Values poster to display in their building. “The emphasis on CORE Values helps us to create a better learning environment in our schools and a better living environment in our neighborhoods,” noted the Superintendent.